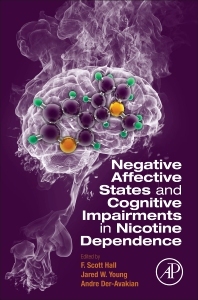 Negative Affective States and Cognitive Impairments in Nicotine Dependence is the only book of its kind that addresses nicotine use and abuse in the context of negative reinforcement mechanisms. Written and edited by leading investigators in addiction, affective, genetic, and cognitive research, it provides researchers and advanced students with an overview of the clinical bases of these effects, allowing them to fully understand the various underlying dysfunctions that drive nicotine use in different individuals. In addition, this book examines animal models that researchers have utilized to investigate the biological bases of these dysfunctions. The combination of clinical and preclinical approaches to understanding nicotine dependence makes this book an invaluable resource for researchers and practitioners seeking to develop targeted treatments aimed at ameliorating symptoms of nicotine dependence, as well as identifying premorbid differences in affective or cognitive function. Human Genetics: What Should We Seek to Model in Animal Studies? Dr. F. Scott Hall is an Assistant Professor of Pharmacology and Experimental Therapeutics in the College of Pharmacy and Pharmaceutical Sciences at the University of Toledo. Dr. Hall’s research investigates the genetic and environmental determinants of susceptibility to addiction and related psychiatric disorders. After a B.A. from Harvard University (1987) and a Ph.D. from the University of Cambridge in 1994, Dr. Hall completed a postdoctoral fellowship at the National Institute on Alcoholism and Alcohol Abuse. Dr. Hall joined the Molecular Neurobiology Branch at the National Institute on Drug Abuse in 1999 where he led the behavioral genetics group until 2014. He has authored over a hundred scientific publications and is a fellow of the International Behavioral Neuroscience Society. Dr. Hall is recognized internationally as an expert in the genetic basis of addiction and the role that early social experience plays in shaping adult behavior and behavioral pathology. I am a Scottish Neuropsychopharmacologist in Sunny California, Dept. of Psychiatry, UCSD. My primary interest is investigating the neural mechanisms underlying cognitive dysfunction in order to develop targeted therapeutics. I specialize in cross-species testing and as such have developed/aided in the development of many such tests including the 5-choice continuous performance test, now in use across the globe, in patients, rats, and mice, with fMRI and EEG recording also available. With regards to clinical populations, I have investigated diseases such as schizophrenia, bipolar disorder, HIV, Tourette’s syndrome, as well as methamphetamine, nicotine, and cannabis abuse. Using this cross-species behavioral testing approach, any work we conduct we hope will have relevance to clinical populations and vice-versa. With this dual approach combined with networking with great collaborators, I hope that more promising therapeutics will not be far away. Andre Der-Avakian, Ph.D., is an Assistant Research Scientist in the Department of Psychiatry at University of California, San Diego and an Adjunct Instructor in the Department of Psychological Sciences at University of San Diego. He received his Ph.D. in Neuroscience from University of Colorado, Boulder and completed a National Institute of Mental Health-sponsored postdoctoral fellowship at University of California, San Diego. Dr. Der-Avakian has published several research articles, reviews, and book chapters on the neurobiology of stress-induced disruption of normal reward processing in rats that may contribute to symptoms like anhedonia and motivational deficits in psychiatric disorders. His research, which is funded by grants from the National Institute of Mental Health and the National Institute on Drug Abuse, is focused on designing and implementing new translational behavioral and neurophysiological assessments of reward and cognitive processes in rats with high relevance to human psychiatric disorders like depression, schizophrenia, and drug addiction.